Have you sent in your resolutions for the upcoming State Grange Session? Not yet? We would like resolutions sent into the State Grange office by September 15th if possible. By submitting them by that date, we will be able to include them in the October Granger and post them on the State Grange website prior to the session. It is preferred that all resolutions go through the Pomona Granges first, but if you find yourself short of time, do send them directly to the State Grange office (after they have been adopted by your Community Grange). Look around your local communities. Watch what is happening at the state and national levels. Do you feel that something should be addressed or changed? Write a resolution. Submit it to your local Grange for their action. This is what the Grange is known for, grassroots legislative activity. All Grange policies come from the members and are passed on to state or national Granges for their action. If you need help writing the resolution the Grange website has a good article on how to write a resolution- http://www.ctstategrange.org/HowtoWriteResolution.asp. The Legislative Committee will be available during the session to assist any committee with their resolutions. The committee members will check in with the session committees offering assistance. I stopped by the 151st Annual Plant Science Day at Lockwood Farm in Hamden in early August. The Lockwood Farm is one of the campuses of the Connecticut Agricultural Experiment Station. There were numerous displays on the activities of the CAES and many other agricultural organizations. The displays were informative and there were also tours of the station and the various gardens. There were also numerous speakers on different topics relating to the experiment station such as beekeeping basics, bed bugs and invasive species. Phil Prelli was recognized for his contributions to the board as he had just retired from the CAES Board of Directors (an extension of his other job he just retired from). He gets to relax in his new rocking chair. I was introduced to Louis Manarelli who is the Director of the CAES. He thanked the Grange for their support of the Experiment Station. CAES is funded by the state and is being hit with possible budget cuts like all other state agencies. They are fighting to keep funding for their projects such as mosquito, ticks and harmful invasive species monitoring. I would recommend Grange members consider attending this event next August. 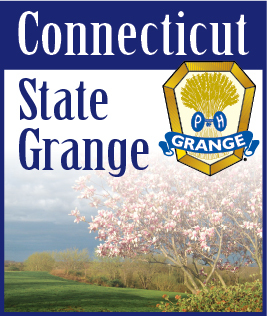 In National Grange’s July/August issue of the New Grange, there is an article about many Granges losing their tax-exempt status with the IRS. The IRS is automatically revoking the tax-exempt statuses for many organizations because they failed to file an annual return for three consecutive years. The IRS did issue warnings for several years that they would be removing nonexistent or noncompliant organizations from their rolls. If you want to check to see if your Grange is on the revocation list, go to the IRS website at www.irs.gov, and click on Charities & Non-Profits. Then click on the Automatic Revocation of Exemption List. If you discover you have a problem, contact the State Grange.